For other uses, see Red heat (disambiguation). 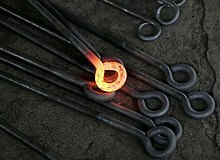 The practice of using colours to determine the temperature of a piece of (usually) ferrous metal comes from blacksmithing. Long before thermometers were widely available it was necessary to know what state the metal was in for heat treating it and the only way to do this was to heat it up to a colour which was known to be best for the work. The visible color of an object heated to incandescence (from 550°C to 1300°C). The peak wavelength and total radiated amount vary with temperature according to Wien's displacement law. Although this shows relatively high temperatures, the same relationships hold true for any temperature down to absolute zero. Visible light is between 380 and 750 nm. ^ Chapman, W. A. J. (1972). Workshop Technology, Part 1 (5th ed.). Burlington, MA: Elsevier Butterworth-Heinemann. ISBN 978-0713132694. ^ When viewed in dull light. ^ A Book of Steam for Engineers. Stirling Consolidated Boiler Company. 1905. p. 50. ASIN B006RXDG3W. This page was last edited on 3 December 2018, at 00:09 (UTC).